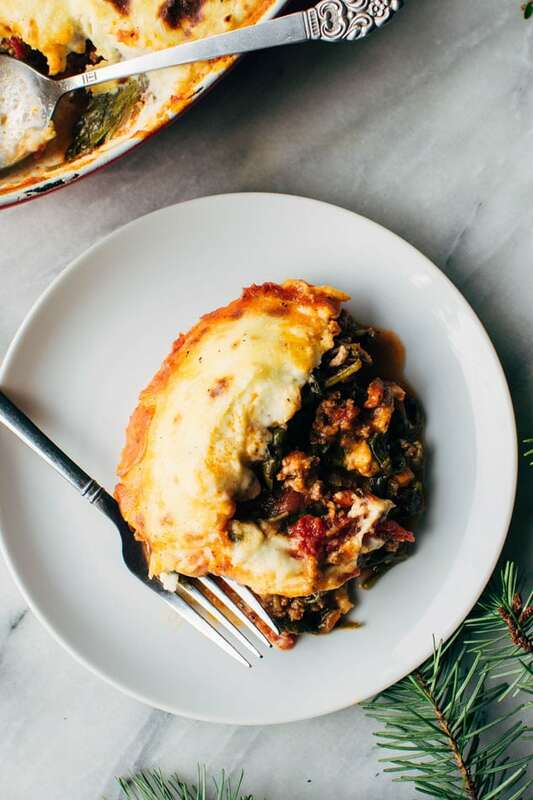 During the colder months, nothing feels quite as encouraging as a bubbling, hearty casserole. 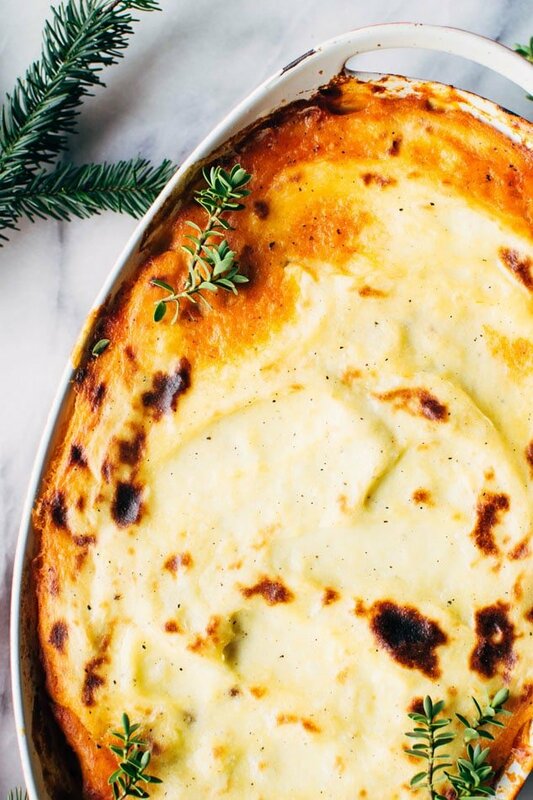 In this week’s edition of comfort food devotion I bring you just that – paleo italian shepherds pie with bolognese sauce and whipped parsnips! Can you tell that besides being obsessed with comfort food lately I’m also kinda head over heels for parsnips? I hope you guys like ’em too! If not, you could choose your own adventure by topping this bad boy off with the more traditional option of potatoes (I did actually sneak a few potatoes into my recipe, too), sweet potatoes, or even cauliflower mash for a tasty low carb option! I’m always about that “make it your own” thing. I’ve made a giant pan of this casserole twice in the past month. The first time I just jotted down ingredients without really taking great notes on cooking times // methods. But the 2nd time I knew I had to do a little bit better because I just HAD to share it with you! The best things in life are shared, right? I am a giant dork, I know. Well now that you guys are in on that secret let’s move right along and dig into some of the details of this tasty shepherd pie! My sauce isn’t technically a proper bolognese sauce, but with all the good stuff in there I hardly think anyone will notice. I decided to call it bolognese because I think it shares enough ingredients and flavors of a classic bolognese to make that association. I would definitely recommend doing a little “mise-en-place” with all of your veggie chopping for the sauce before you even start cooking (even better if you can grab an extra set of hands to help you with this step! Back to that whole, best things in life are shared thing ) That way once you start the sauce you can just clip right along, and start prepping the whipped parsnips all at the same time. A comforting casserole is great, but a comforting casserole made quickly is even better. I sort of “cheat” and take a short cut with this sauce recipe by using a jar of my favorite marinara sauce instead of canned tomatoes. It shortens the cooking time and also has a great texture. Whole foods has an organic “Fat Free” marinara sauce that’s super affordable and tastes amazing. In the processed food world sometimes fat free can actually be good words to look out for (as in the case of this marinara sauce) because it means they have left out highly processed vegetable oils (they’ll try and sneak that stuff into ANYTHING!) and also any unwanted dairy. I like to let the sauce simmer and reduce for as long as I can. You might want to get the sauce started a little bit earlier in the day then when you plan on eating, as the flavors will get super concentrated and you’ll reduce the amount of liquid that goes into the bottom layer of the casserole. The less liquid you have the sturdier your casserole will turn out, AND the less bubbling over you’ll have to deal with once it’s in the oven (speaking from experience here ). Uneccesary oven cleaning is kind of the worst. 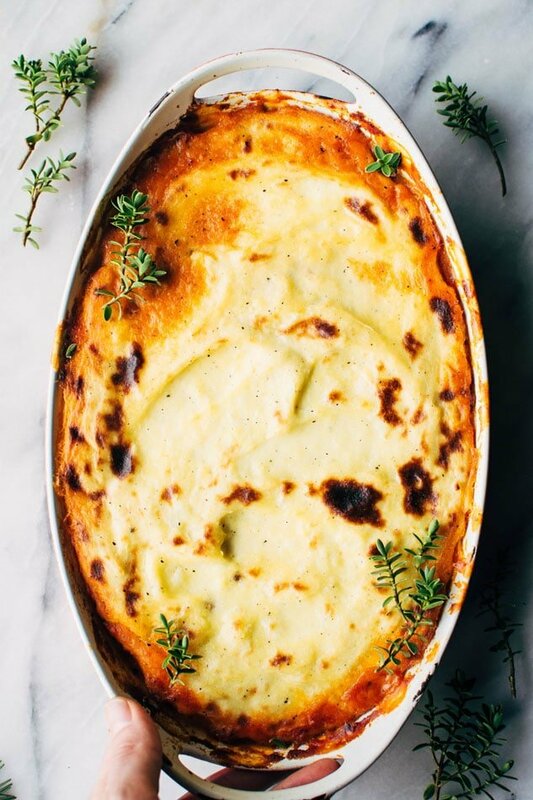 Once the sauce is ready and your parsnip + potato combo are whipped you’ll be ready to layer it together and pop it in the oven for a quick 20 minutes! To get some nice browning happening on the top you can take the casserole out of the oven, brush the top with a little melted ghee or avocado oil and stick it under the broiler for just a couple minutes before serving. Not a necessary step but it does make it look nice and you get some of that tasty caramlized flavor going on! 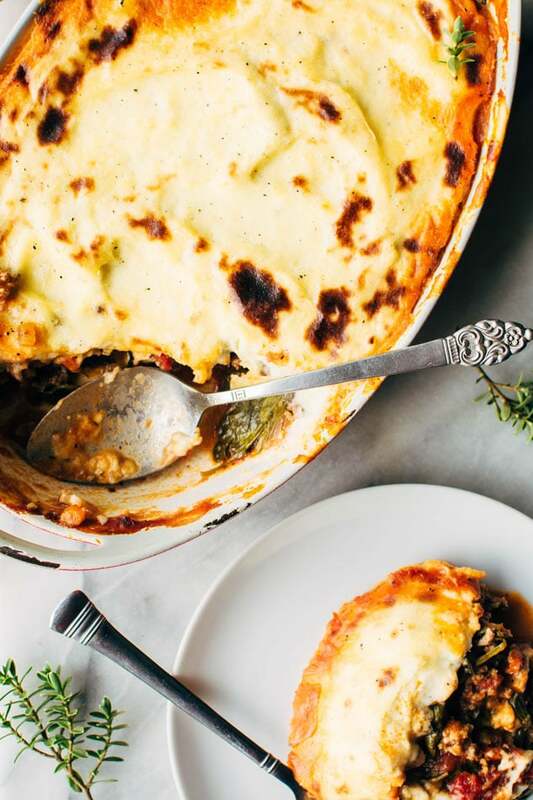 If you’re into the cheese thing you can grate some parmesan over the top just before serving, but if you can’t have dairy or just aren’t into it, you won’t be missing out on cozy flavors at all by leaving it off. 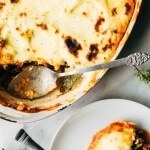 Paleo italian shepherds pie with bolognese sauce and whipped parsnips! 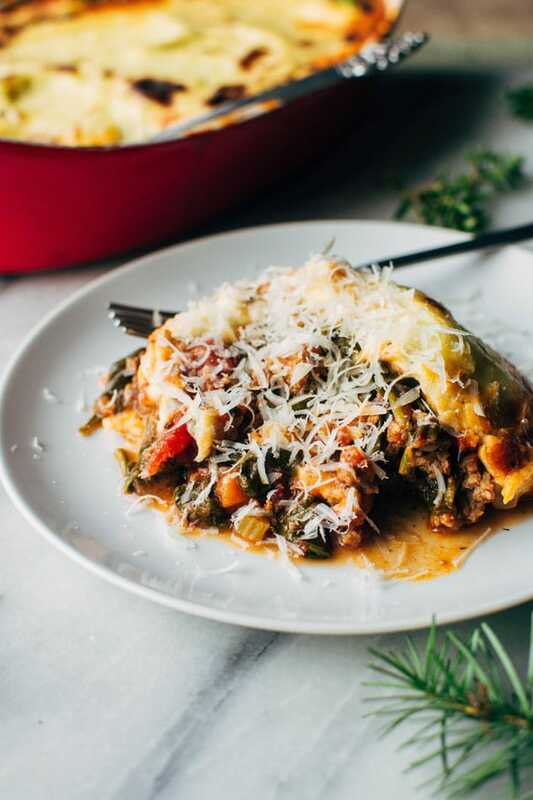 A delicious and easy casserole packed full of veggies and delicious flavors – perfect for a healthy cold weather dinner! Saute diced onion, celery and carrots with a large pinch of salt over medium heat until vegetables start to soften and brown slightly. Add zucchini and garlic and cook another few minutes until zucchini starts to soften and garlic is aromatic. Move vegetables to the edge of the pan, creating a circle of open space in the hottest part of the pan. Add ground beef and pronto the center of the pan and press into a flat disk. Turn heat up to medium high and season liberally with salt, pepper and paprika. Cook for a few minutes, and sort of flip the meat and press it into the pan to brown the other side. After the other side is nicely browned you can break up the meat and stir back in the vegetables. Tilt the pan and spoon off as much of the extra fat as you can. Add in tomato paste, canned tomato sauce and oregano. Reduce heat to medium low and simmer for roughly 30 minutes – about the amount of time that it will take to make the parsnips. Place parsnips and potatoes in a large pot of water and bring to a boil. Cook until very soft, about 20 minutes. Drain parsnips and potatoes and put in a large food processor along with sour cream (or cashew cream + lemon juice), ghee, salt and pepper. Parsnips and potatoes can also be whipped in a stand mixer, blender, or by using a handheld potato masher. Before transferring to the casserole season meat sauce with salt, a splash of red wine vinegar, and then add the baby spinach. Cook a few minutes, just until wilted. 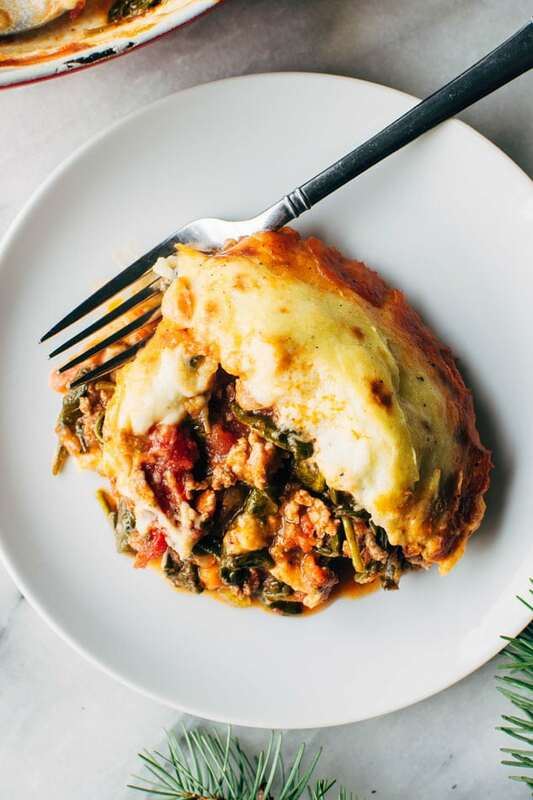 Pour meat sauce into the bottom of a 9×13 inch pan, only filling about halfway – you may have some extra sauce – the less watery the sauce is the better your casserole will turn out and the less risk you run for bubbling overflow in the oven! 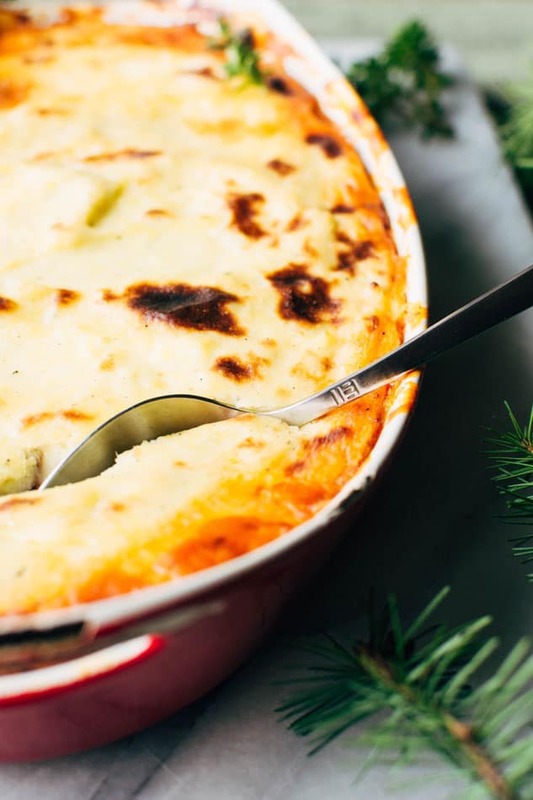 If you’re concerned your casserole might cook over place a baking sheet lined with parchment paper on the rack below the casserole – just in case. Spoon parsnip and potato mixture over the top, gently spreading into an even layer. Bake in oven for about 20-25 minutes minutes, until bubbling hot. The next step is totally optional, but will give you a nice brown crust on the top of the casserole. Remove from oven and brush the top with a little melted ghee or avocado oil, and turn the oven onto high broil. Broil for just a few minutes, keeping a very close eye on the casserole so it doesn’t burn! Take out of oven and allow it to rest for a few minutes before serving. Serve, topped with some freshly grated parmesan if desired. This entry was posted in dinner and tagged easy, gluten free, grain free, healthy, paleo on February 20, 2017 by Nyssa Tanner.